FILE - Packages from Amazon.com are delivered in New York. 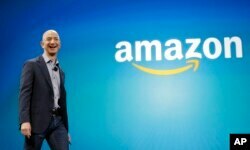 The largest American business lobby group came to the defense of Amazon.com on Tuesday after a multi-day Twitter attack by U.S. President Donald Trump that included unsubstantiated criticism of the world's biggest online retailer. The value of Amazon shares held by Jeff Bezos, the online retailer's chief executive and single largest shareholder, had taken a $10 billion hit in the week since Trump began attacking him and his company on Twitter. Citing an unspecified report, Trump told reporters at the White House that the company was not paying the U.S. Postal Service a fair rate, and that it was costing U.S. taxpayers billions of dollars and forcing other retailers out of business, and he threatened to raise rates. Late on Tuesday afternoon, a source familiar with proceedings at the White House said no specific actions addressing Trump's concerns about Amazon were on the table at the White House at this time, but that could change given Trump's dissatisfaction with the company. The U.S. Chamber of Commerce, the largest business lobby group in the country, stepped in on Tuesday to defend Amazon, which is a member. "It's inappropriate for government officials to use their position to attack an American company," Neil Bradley, chief policy officer of the U.S. Chamber of Commerce, said in a statement, citing the value of the free enterprise system and the rule of law. "The record is clear: deviating from those processes undermines economic growth and job creation." It is not the first time Trump, or another U.S. president, has been publicly critical of a company. Trump has previously criticized automakers, Carrier, which is owned by United Technologies and Boeing. In 2015, then-President Barack Obama criticized office supply company Staples for not embracing the Affordable Care Act, drawing a quick rebuke from Republicans and the U.S. Chamber of Commerce. Trump has progressively escalated his criticism of Amazon and Bezos, who also privately owns The Washington Post, which has published stories that have angered the president. Bezos, ranked by Forbes magazine as the world's richest man with an estimated net worth of $115.6 billion, owns 78.89 million Amazon shares, worth about $110 billion at Tuesday's market close. Amazon shares closed up 1.5 percent at $1,392.05. The shares started the day higher but fell as low as $1,355.33 after Trump's latest Amazon-related tweet. Trump has accused Amazon of not paying enough tax, taking advantage of the U.S. postal system and putting small retailers out of business, but he has offered no evidence to back up his criticisms. "The post office is losing billions of dollars ... because it delivers packages for Amazon at a very low rate," Trump told reporters on Tuesday. "If you look at the cost that we're subsidizing, we're giving a subsidy to Amazon." Trump offered no details about the report he cited or how he might charge the company more through USPS. Amazon also ships packages through providers such as FedEx and United Parcel Service as well as its own experimental shipping service. Representatives of Amazon and USPS had no comment on Trump's tweet on Tuesday and could not be immediately reached regarding his latest comments to reporters.